Chris Alfaro is Free the Robots. The genre-defying artist pulls together heavy doses of traditional jazz, psych, electronic and hip-hop, with progressive melodies and devastating drums into a rich pot of sound. His techniques create harmony between genres with the blending of obscure samples with analog and digital compositions. Based out of Santa Ana, CA, Free The Robots started as a side project by Alfaro in 2003 while also playing with different bands, producing MCs and DJing. Having worked with so many different styles of music, Free the Robots brought everything together under one roof, allowing further exploration. With the use of samples, Controllers, and other live instruments, Alfaro creates a balance between the sounds of the past, present and future. Free the Robots has reached a worldwide audience since its humble beginnings and found its place among the top artists in this genre. With the constant development of Alfaro’s sound and live show. 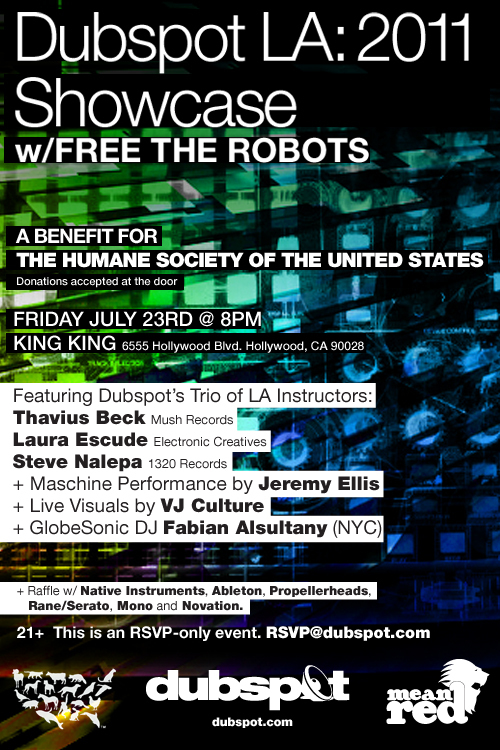 Free the Robots Has shared the stage with the likes of Prefuse 73, Flying Lotus, the Glitch Mob, Afrika Bambaataa and more. Thavius Beck is a composer of mercurial soundtracks for uncertain times conjoining various strains of electronic music to arrive at a daringly ambitious sound. An exceptional programmer, engineer, multi-instrumentalist and certified Ableton Live instructor, Thavius Beck’s many talents allow him to take music from idea to completion with an uncompromising vision and ear. Thavius Beck has produced and release several albums including 2006′s THRU and 2009′s Dialogue on the Mush label, and has collaborated with everyone from Busdriver and Dadelus to Saul Williams and Nine Inch Nails. He also leads a music production workshop in downtown Los Angeles titled Production 101 – the workshop focuses on music creation on Ableton Live. Laura Escudé is a critically-acclaimed violinist, composer, sound designer, music technologist and educator. She specializes in the software program Ableton Live and became one of the world’s first Ableton Certified Trainers in 2008. In 2009 she worked on Cirque du Soleil’s “Viva Elvis” as an Ableton Live programmer, toured Europe with acclaimed world music band Niyaz, was a tour consultant for Kanye West and recorded violin on EastWest’s Silk sound library. She has worked with diverse directors, artists and composers such as J.J. Abrams, Jason Reitman, LMFAO, Mark Isham and Carmen Rizzo. In 2010 Laura released her first full length album Pororoca, a beautiful marriage of cinematic strings and edgy electronics, along with an animated video designed by Scott Pagano (Trifonic, BT, Michael Jackson). Steve Nalepa is an LA-based producer, professor and mad scientist collector is an electronic musician revered in avant-garde circles for his studio alchemy and genre bending: he’s produced tracks with such legends as Bill Laswell and Pharoah Sanders, performed with the LA Philharmonic at Walt Disney Concert Hall, and shared the stage with some of the most revered electronic musicians and video artists in the world. 1320 Records released his triple album “Flatlands” in 2009, the original compositions accompanied by a collection of music videos and remixes from an all-star cast of luminaries including The Glitch Mob, Deru and Nosaj Thing. Nalepa is one of 100 artists featured in the acclaimed “Visionaire 53: Sound”, his music joining original pieces from David Byrne, Danger Mouse, Lalo Schifrin, U2 and more on five 12” vinyl record picture discs packaged with a portable record player inside a specially produced domed case. He has scored several films, including Robert Adanto’s acclaimed feature length documentaries “The Rising Tide” and “Pearls On The Ocean Floor.” When he’s not in the lab, scoring films or rocking dancefloors, Nalepa can be found inspiring the students in his music technology classes at Chapman University Conservatory of Music. Jeremy Ellis developed from student of jazz and classical piano and percussion, cutting his teeth in the Detroit music scene performing with Jazzhead, the jazz-fusion group that also featured Ubiquity label mate John Arnold. He has played worldwide as a member of Time:Space, and over the years has worked with Detroit producers John Beltran, Carl Craig, Recloose, and Alton Miller. Artists as varied as Bach and Chopin, Stevie Wonder and Herbie Hancock, the Beatles and U2, are his main influences. He’s an extremely curious musician always delving into new styles and picking up new tricks as he goes. The Detroit-based musician moved to Puerto Rico to create an album marrying traditional Bomba and Plena rhythms with Detroit-schooled dance music. After three months, the keyboard maestro and golden-toned vocalist discovered that the living in Puerto Rico ain’t so easy. On his way home he lost two computers, all of his recordings, half of his recording advance, and his passport (and possibly part of his mind). Fortunately, Ellis returned in one piece with the musical knowledge and resolve to create The Lotus Blooms, an album of insatiable future funk grounded in Detroit and peppered with a Puerto-Rican persuasion. Ellis has a reputation as an amazing live performer. The list of Jeremy Ellis live performances includes show at the Detroit Electronic Music festival in 2001 and 2003, playing with Jazzanova and Koop, headlining with Kyoto Jazz Massive in Tokyo, rocking all-night block parties on the streets of Puerto Rico and kicking off the Ubiquity/Puma SoundClash series in San Francisco. GlobeSonic dj Fabian Alsultany – first-generation American of Iraqi and Cuban decent, Fabian Alsultany has spent his life bridging gaps. Dubbed by Billboard Magazine as the “world music impresario,” Alsultany is a dj/producer, entrepreneur, futurist, and ritual connoisseur. He was initiated in to the DJ path in the early 80’s experiencing life as a teenage New York City club kid. The inspiration he found at clubs from the Tunnel to Mars he brought to dance floors as a student at the United Nations International School in Manhattan. Over two decades later, his global approach to interweaving cultures and genres continues as he heads the GlobeSonic Sound System, New York City’s hottest international music DJ collective. Living in the kaleidoscopic expanse of NYC, Alsultany’s experience reflects the sonic hybridization evolving since cultures began crossing. He mixes a celebratory ecstatic dance soundtrack of sacred sounds and eclectic riddims from India, The Middle East, The Americas, The Milky Way, and the Outer Reaches of the Universe; creating a harmonious melody stretching across oceans, political borders and astrological constellations. Born from the electronic urban pavement of his hometown, the pulse of ancient lands, and sacred songs from the vine, Alsultany’s knowledge of traditional and modern styles is boggling. With each DJ set an encyclopedic history of the future of the world unfolds. Grant Davis VJ Culture – Grant Davis gave up his collegiate ideals of working with deaf children 12 years ago when he first experienced a live VJ environment in Black Rock City. As a Communications Disorder Specialist, he found visuals to be a unique way to interpret music for the deaf. Since then, under the name VJ Culture, Grant has provided sight and sound for audiences around the world. In Torino, Italy he performed 19 shows with the Magnetic Poets during the 2006 Winter Olympic Games. UK’s DJ Mag has voted VJ Culture among the top 10 VJs in the world for the past three consecutive years. He has also toured with Beck during the summer of 2006. After returning from a tour in Japan, in the fall of 2007 Grant performed at the American Music Awards for Mary J Blige on Element Lab’s Versa Tubes, live with 7 million viewers.StarCulture is Grant and David Starfire’s current A/V project. Combining original motion graphics with mashups of music videos and David Starfire’s (Six Degree’s Records) unique world rhythms breaks. StarCulture has recently performed at the International Forum Mexico in Monterrey Mexico, MussikMesse Frankfurt Germany and MacWorld SF.